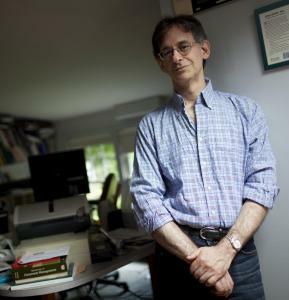 As a longtime critic of standardized testing, Alfie Kohn knows the score in his ideological battle with those who favor the exams as a way to hold students and teachers accountable. “They’ve won,’’ Kohn said bluntly. But the Belmont resident, with 12 books to his credit, says fighting the status quo doesn’t mean he’s a lone voice. Kohn is helping to moderate a discussion tonight at 7 p.m. at the Belmont Studio Cinema after a screening of “Race to Nowhere,’’ a widely viewed documentary that is critical of the pressures placed on children to excel. Tickets to the event are $15, with proceeds benefiting Belmont’s public schools. Argelis Roman, one of the organizers of tonight’s event, said that although she doesn’t agree with all of Kohn’s views, she thinks he is an important voice in the conversation about education issues. In his books, Kohn makes his case against standardized tests, homework, and rewards such as grades and praise for students. For example, Kohn said, research shows that homework provides no benefit to young children. Kohn, who works as an independent scholar and lecturer, authored a book called “The Case Against Standardized Testing’’ in 2000. Yet in the ensuing decade, public policy has shifted overwhelmingly toward, rather than away from, standardized testing as a way to measure student achievement. In 2001, Congress passed the No Child Left Behind law, requiring states to assess students’ basic skills and penalizing schools that fail to meet certain benchmarks. Kohn argues that, far from improving schools, the focus on standardized tests actually has had a negative effect on students. But Kohn disputes that standardized testing is the only way to ensure fairness. Monty Neill, executive director of the Boston-based National Center for Fair & Open Testing, said Kohn’s work is reaching a wide audience, even if his perspective isn’t shared by many people running education today. “Alfie is a voice that many, many parents, as well as teachers, listen to,’’ Neill said. “They view him as one of their champions.